Ski-in, Walk-in /Ski-out accommodations will make your ski vacation one to remember for a life time! Norwegian Log allows you to slip into your boots and ski right to the lifts in the morning, then 'slide right back' for lunch. Located directly under the Silver Bullet Gondola with magnificent views of our Yampa Valley. This two-story condo with three bedrooms & 3 full bathrooms will afford your every need for comfort, amenities and convenience. Featuring a king bed in the master with a en-suite to talk about. Huge walk-in shower with 4 shower heads, heated floors and double sinks. 42" TV. The queen bedroom has a bathroom opposite the room with a huge soaking tub, shower, double sinks and heated floors. On the main floor provides the 3rd bedroom with two twins that can be made into a comfortable king bed. The 3rd bathroom is on the main floor with all of the living space. Renovated kitchen with stainless steel appliances. Two decks with outdoor furniture and a weber gas grill. The condo comes with a washer & dryer in the unit, free Wi-Fi, 2-car garage and views of the Yampa Valley. Living Room now features 65" Samsung Smart TV. Absolutely spectacular. After an epic day on the slopes, soak those weary ski legs in the large common area hot tub or relax by the fire with a glass of wine and watch the sun go down. If you have always wanted the luxury and convenience of ski-in, ski-out accommodations, you can now afford it by renting direct from the owner. This unit is not on the free city bus route and does not have a shuttle. You must have a car. The ski-in/out access only works when the snow is good & it is cold. You also must be a good skier. *Depending on your dates I can save you over $50 per day, per adult off your lift tickets depending on your dates. Massive savings on lift tickets. Kids Ski Free. Restrictions apply on length of stay, minimum purchase on lift tickets. Call Kim Filler, Owner of "Condos in Steamboat" for details. vrbo does not allow me to list my phone number. You must reserve your lodging several weeks in advance to have the time to order discount lift tickets. The earlier you book, the more you can save. Please feel free to call Kim in Steamboat to ask questions about the unit, amenities, lift tickets and daily lodging discounts offered. 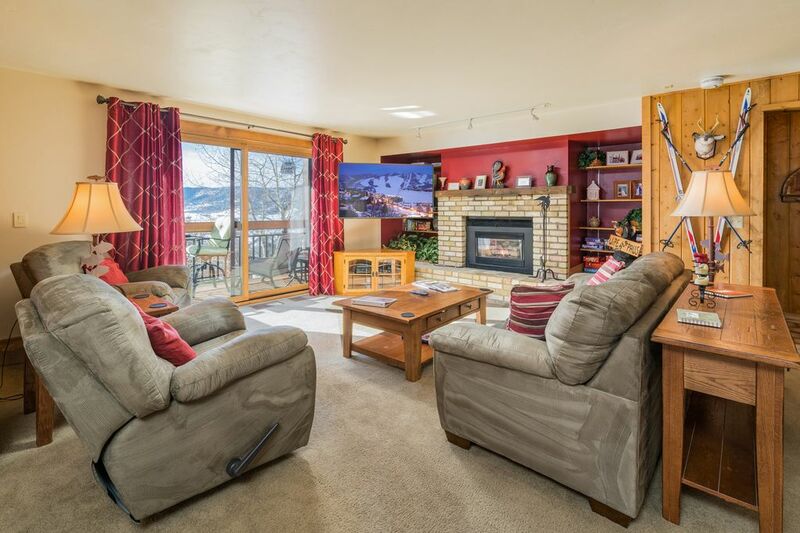 This unit is managed by Condos in Steamboat. Kim and Dan Filler, owners of Condos in Steamboat have lived, worked and played in Steamboat for nearly three decades. We will make sure you vacation is one to remember. You will keep coming back to Steamboat year after year - we promise! We have just returned back to our home country of England. We resided in Bermuda for the past 18 years. We have been going to Steamboat for so many, many years and we just love it there. We rented unit 202 at Norwegian Log a long time ago. In 2004 we purchased it. We love the views and the square footage. We love the fact you can ski in and out. We recently renovated the unit so now we have a new kitchen and new bathrooms. Kim takes care of the unit for us. She lives in Steamboat and owns Condos in Steamboat, a small property management company. Kim keeps the unit looking new and it is perfectly clean each time. This is a very well organized condo that is wonderfully equipped. I would definitely rent this until again. Stayed here in late February for a ski trip. The condo is roomy, clean, in excellent shape (with portions like the upstairs bathrooms recently renovated), and in an unbeatable location. The beds and couches were extremely comfortable. The condo was stocked with everything we needed to cook (a welcome surprise), and the manager Kim was responsive and extremely helpful. Would absolutely recommend staying here and I will definitely stay here again! The property was very clean and was plenty of room for my family. The large TV made it nice to watch football and a little Netflix at the end of the day. The beds were comfortable and the kitchen was nicely equipped. Kim was a great help providing plenty of information about transport to/from the airport as well as helping with discounted lift tickets. The Ski In/Out although doable is a little more cumbersome than what I would have preferred. The journey to and from the slopes may be a little more difficult for younger or novice skiers. We chose not to rent a car and the location of the house is nice but not as convenient to restaurants if you are looking to walk. Its about a mile to get down the hill which for us wasn't an option. We Uber'd everywhere. The good news is, there are plenty of Uber's/Lyft's around and one way was between $15-$18 and so I feel like we came out ahead in the end. All said, the property was above average and the help Kim provided was excellent. Perfect place for a family vacation! Very close to everything you need. My favorite parts are the wonderful bathrooms with heated floors and multiple shower heads and the 2 lovely balconies. The condo was in fantastic shape--the owners have made it very accommodating, but it still feels like home. The management was great--Kim took care of everything we needed. When we return to the area, we will definitely look to Kim and Condos in Steamboat for our accommodations. The only possible problem one could have here are the stairs--there are a lot of them. But, it didn't bother us, and wouldn't keep us from going back. The garage was also great, and would be a real must if returning in the winter. We have traveled to ski in the West once or twice a year since 1973 and have stayed in all types of accommodations at various resorts over those years. Kim and the group from Condos in Steamboat are absolutely great to work with for all of your needs! This unit in particular is outstanding and easily handled our group. Unless you are a beginner it is an easy ski in/ski out (that could be challenged by the amount of snow - we had plenty). But it is also and easy walk as well. Although we did not use it, there is a very reliable shuttle service as well. The condo has everything you need to cook at home, great views across the valley and plenty of room to enjoy your apres ski time. The heated garage for two is an outstanding benefit as well. We will keep this condo, Kim and her team in mind for our next trip to colorado.